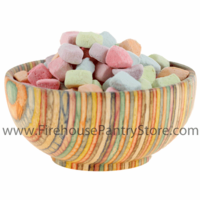 Everyone with a box of Lucky Charms cereal has done the same thing - picked out the best part - the marshmallows! 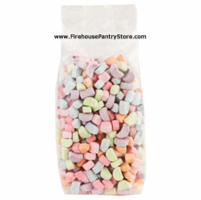 Save yourself the trouble by gettin' a bag of these yummy, rainbow colored, charm shaped, crunchy, dehydrated marshmallow bits. You can't deny, it's a tempting treat for yourself and a really cool gift for your favorite sweet snacker. Perfect for sprinkling over your favorite frozen yogurt or ice cream, too! Ingredients: sugar, modified cornstarch, corn syrup, dextrose, gelatin, sodium hexametaphosphate, artificial color (red 40, yellow 6, blue 1, yellow 5), artificial flavor, natural flavor. Packaged in a facility that also packages wheat, milk, soy, egg, peanuts, and tree nuts. Please Note: These marshmallows, as they are dried and brittle, rub against each other during shipping and create some "marshmallow dust". Regardless of cushioning used in the shipment box, this issue cannot be avoided. There will be a small amount of "marshmallow dust" in the bag.